Folks, the hits just keep coming from James Comey, who it appears kept a whole bunch of incredibly detailed notes about his relationship with Donald Trump, all of which are slowly coming to light in the aftermath of his firing. The decision to terminate him is looking increasingly like the type of thing the president would want to take back if he could, and also if he possessed the intellectual capacity for regret or shame. Last night, The New York Times released yet another set of extremely detailed stories about the brief, fraught relationship between the two men, detailing the president’s awkward, inept flattery and the FBI director’s increasing sense of unease about the whole thing. Many of the actions look a little funny, as far as the whole “obstruction of justice” and “investigation into possible Russian interference” things go, but, moreover, they also look very funny in the literal sense. 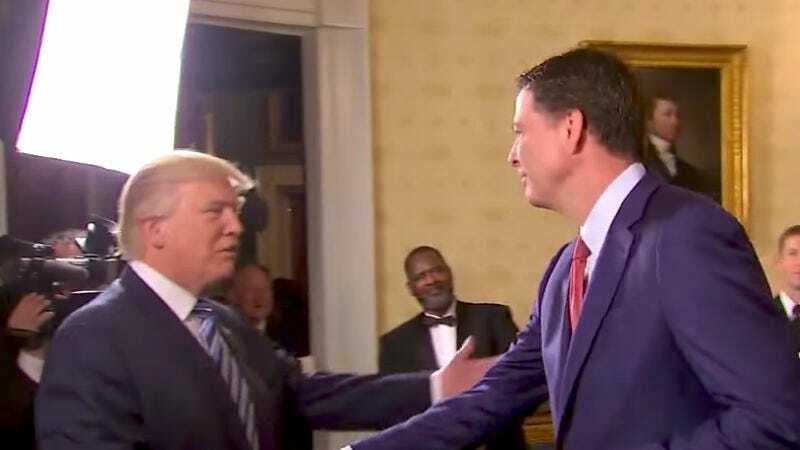 With an abashed look on his face, Mr. Comey walked up to Mr. Trump. The camera’s swing to spot Comey earnestly attempting to disguise himself as just a simple, everyday curtain has the feel of an Arrested Development whip-pan, and the strained, character-based physical comedy of their ensuing interaction feels like, well, another Arrested Development joke. (Good thing that fifth season is happening.) The whole thing sort of cosmically rhymes with the other indelible image of what is hopefully the beginning of the end of the Trump administration—that of press secretary Sean Spicer hiding among the bushes rather than face journalists’ questions. Both suggest the lengths some of our most powerful people have gone to reconcile with the blundering idiocy of our 45th president. In the months and years to come, as details leak out about the comedy of errors that has been the Trump presidency, short videos like this will become funnier and funnier in hindsight, assuming we are not all dead, in thought-prison, or scavenging for scraps of food along with everyone else in a war-ravaged hellscape.